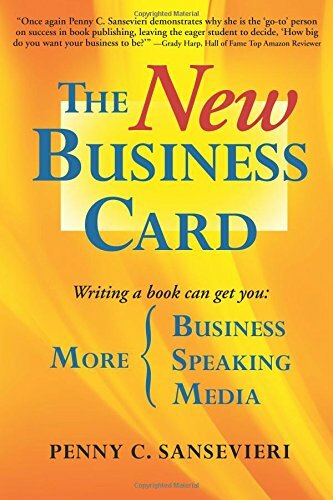 Once again Penny Sansevieri has presented excellent resources on how to expand one's business and marketing through “The New Business Card,” a book that educates the reader on ways to highlight their expertise. This statement in particular from the author, “Bottom line, no matter how big or small your business is, you should always be on the lookout for ways to increase your revenue,” should be the motto for all entrepreneurs. I agree with the author when she states that consumers are overwhelmed when it comes to products. I was recently searching for information on depression with residents in nursing homes; there were so many choices touting they were the best. How does one choose? What makes one product stand out from all the rest? This book will teach you how. Another important thought given by Sansevieri is that when one wants to keep consumers coming back to your website it is important to educate by providing helpful, insightful and informative content. This shows your audience that you know your subject area and are willing to share that expertise with them. I love that Sansevieri provides exercises in each chapter to help you set goals and define exactly who your clients are and what they want. Her down to earth tone and language throughout the book is one of support and encouragement. It is easy to read and follow, with numerous suggestions as to where to get more information and examples. Surprisingly to me after reading the section on audio books I surveyed several of my friends and was somewhat surprised at the number of those that utilize audio books. I think for me it is using my imagination as to the facial expressions and behaviors characters might use as opposed to having someone do it for me. I highly recommend “The New Business Card” by Penny Sansevieri to anyone who wants to step outside the box, bring more clients to their product and keep them coming back for more.